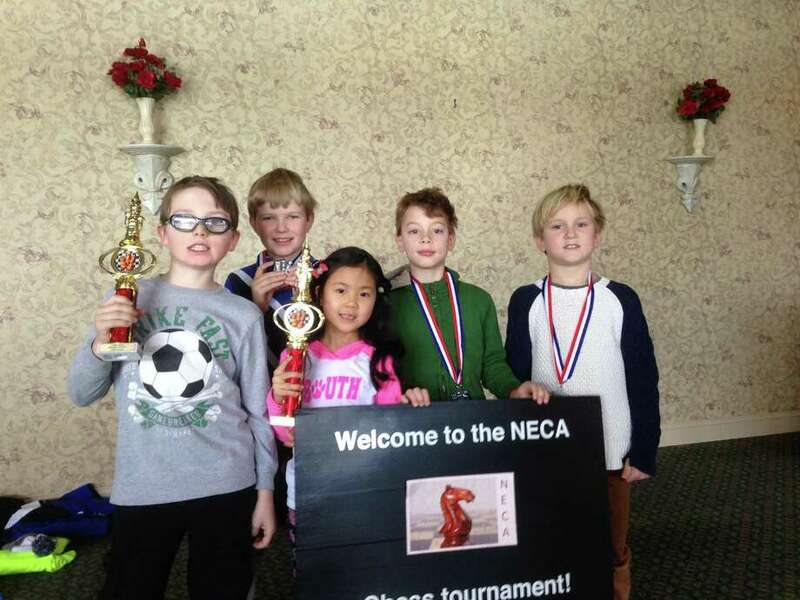 The South Elementary School Chess Club won first place out of 18 school teams at the National Education Chess Association (NECA) tournament held recently in Stamford. The seven member South School team was led by Jenna Ho, who placed first out of 35 players in the First Grade section, and Nathaniel Moor, who won first place in the Elementary Open section. Both finished the tournament with a perfect score, winning each of their four games. Luke Van Dussen also had a strong showing, finishing second place in the Primary Novice section, as did Joseph Ho, who finished in 6th place in the Elementary Open section. Henry Chandra made a significant contribution to the final team standing in his first -ever chess tournament and South School received valient efforts from Thomas Crehan and William Cox. Despite having only seven players present, South School outplayed teams with twice as many players and finished on top of local chess powerhouses, such as Brunswick and Whitby Schools. This was South School's best team victory at a NECA tournament and a historic first place finish. For more information about the South Elementary School Chess Club, please contact Joseph Ho at josephho75@yahoo.com.